Cayo Ensenachos is a tiny island of about 1.7 km2 (0.66 sq. mi) located in the Bahia de Buenavista (Buenavista Bay), off the northern coast of the province of Villa Clara, in Cuba. Cayo Ensenachos is between Cayo Santa Maria (to the west), and Cayo Las Brujas (to the west). With its two neighboring cays, they together constitute the beach resort of "Los Cayos de Villa Clara" also known as the "Cayeria del Norte". See the interactive map at the bottom of this page. The "Cayos de Villa Clara" mini-archipelago is itself part of a much bigger one called "Jardines del Rey" (King's Gardens), it’s in the western part of this large archipelago. This region is also part of the Buenavista Biosphere Reserve recognized by UNESCO. Click to see aerial view of the King's Gardens archipelago. From an administrative point of view, the Cayos of Villa Clara are part of the municipality of Caibarién. The archipelago is uninhabited, only hotels and tourism services are found on the cayos. The "Cayos de Villa Clara" are connected to the main island of Cuba by a 48-km (29.8 mi) causeway (called Pedraplen in Spanish). This colossal project was carried out in 10 years (1989-1999) and the work was done by the company "Campaña de las Villas". This long "road over the sea" starts near the coastal town of Caibarién and reaches first Cayo Las Brujas, then Cayo Ensenachos, and finally Cayo Santa Maria. The capital of the province of Villa Clara is Santa Clara; it’s about 100 km from Cayo Ensenachos. It’s a few kilometers from Santa Clara where you can found the Abel Santamaria Airport (aka Santa Clara Airport, code: SNU), which is the closest international airport serving Cayo Ensenachos, Cayo Las Brujas and Cayo Santa Maria. The transfer between the Santa Clara Airport and Cayo Ensenachos takes about 85 minutes. There’s a small local airport on Cayo Las Brujas (the island next to Cayo Ensenachos and Cayo Santa Maria), but it’s only for domestic flights. The closest towns from Cayo Ensenachos are: Caibarién (50 km / 31 mi), Remedios (about 60 km / 37 mi) and Camajuaní (about 77 km / 48 mi). The central location of the province of Villa Clara allows visitors to easily access some other well-known places and cities such as Cienfuegos (183 km / 114 mi), Trinidad (172 km / 107 mi) and the "Sierra del Escambray" (mountain chain and national park). Cuba's capital, Havana, is however quite far from Cayo Ensenachos, about 404 km (251 mi). © Google Earth. 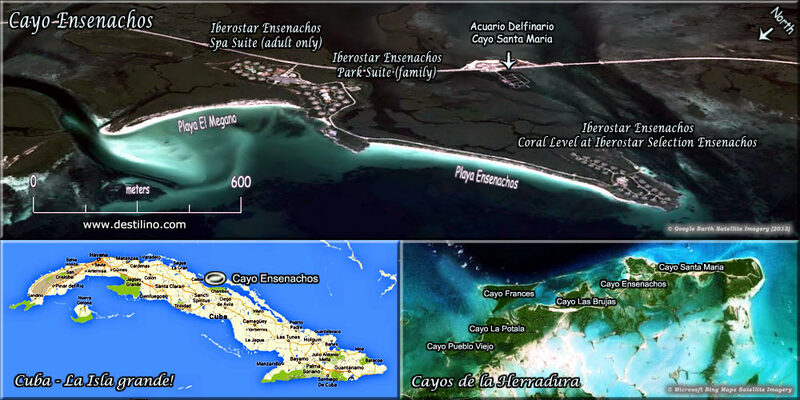 In the satellite image above, you can see the location of Cayo Ensenachos. Move your mouse pointer over the markers to view the info. Using your mouse, you can move the image (click and drag) to see other points of interest in the region. The mouse's wheel no longer works to zoom in or out. We are Lily and Normand, globetrotters and Cuba lovers. Our travels took us to many wonderful countries around the world, but Cuba will always have a special place in our heart. We've been to "La Isla Grande" more than fifty times. We like to call Cuba our "segunda casa". We are Canadians so we need to escape from our harsh and long winters once in a while! Traveling and building websites are our greatest passions. Cayoensenachos.net is online since 2005!